Rembrandt Harmenszoon van Rijn (1606–1669), The Conspiracy of the Batavians under Claudius Civilis (detail) (1661-2), oil on canvas, 196 x 309 cm, Nationalmuseum, Stockholm. Wikimedia Commons. If ever there was a life described in self-portraits, Rembrandt’s was. You can see the effects of age and his many troubles, his bankruptcy, difficulties with ‘the powers that be’, and the pressures put on Hendrickje Stoffels, his partner in later years. Despite that toll, perhaps because of it, his painting just got better and better. The one painting from his final years which has had a more mixed reception, but which I think remains one of his most brilliant narrative works, is his Conspiracy of the Batavians under Claudius Civilis (1661-2). If you were fortunate enough to see it on tour in the exhibition Rembrandt, the Late Works, or in its home at Stockholm’s Nationalmuseum, I hope that you agree. The mighty Roman Empire consisted of a myriad of small tribes scattered throughout its lands. One such tribe was the Batavi, a warlike group of no more than about 35,000 people living in swamp land in the Rhine delta roughly where the southern part of the the Netherlands is today. Its capital was near modern Nijmegen. They had negotiated a good deal in the Empire: rather than pay direct taxes on their lands, like most tribes, they supplied the Roman army with around 5,000 men, many of whom served in the elite regiment of the German Bodyguards. Their leader at this time was Gaius Julius Civilis, who had a quarter of a century of military service behind him, in the course of which he had lost one eye. In the late 60s CE, the Batavi had become disaffected with Rome. Civilis and his brother were arrested and charged with treason by the emperor Nero, but while Civilis was awaiting trial, Nero was overthrown and then committed suicide. His successor, Galba, acquitted Civilis and allowed him to return to the Batavi, where he was arrested again on the orders of the local Roman governor. Rome then went through its own crises, with coups and political upheavals, and Batavi military support was suddenly needed. Civilis was released to help the cause, but the disaffection of the Batavi deepened. With civil war raging in the Empire in 69 CE, Civilis led a revolt against the Romans, besieging a camp containing 5,000 Roman legionaries. The following year the Batavi appeared to be gaining the upper hand, but the Romans brought more substantial military forces to bear, and the Batavi made peace again. This chapter in the history of the Roman Empire is detailed by Tacitus, in The Histories, book 4. Although known in Tacitus’ account as Gaius Julius Civilis, in art history he has become known as Claudius Civilis. The revolt started when Civilis gathered the tribal chiefs and military leaders at “one of the sacred groves”, for a banquet. There he convinced them to join in the rebellion, binding then “with barbarous rites and strange forms of oath”, according to Tacitus. 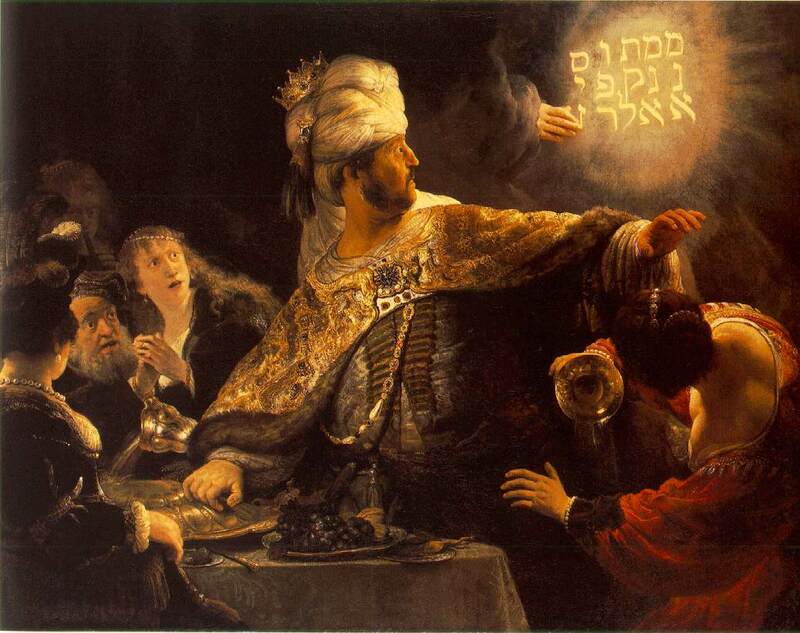 Rembrandt had long been well aware of the role of light in bringing intensity to narrative, for example in his Belshazzar’s Feast (c 1635-1638). But in these late years, he was exploring lighting effects even more deeply, as shown in his Ahasuerus and Haman at the Feast of Esther (1660). This – another banquet scene but on a completely different scale – was taken from an Old Testament story from the book of Esther, via the contemporary play Hester by Johannes Serwouters, first performed in 1659. The original narrative revolved around Haman, one of King Ahasuerus’ officials, who proposed to hang Mordechai as a scapegoat for the Jewish nation, as revenge for their pride. 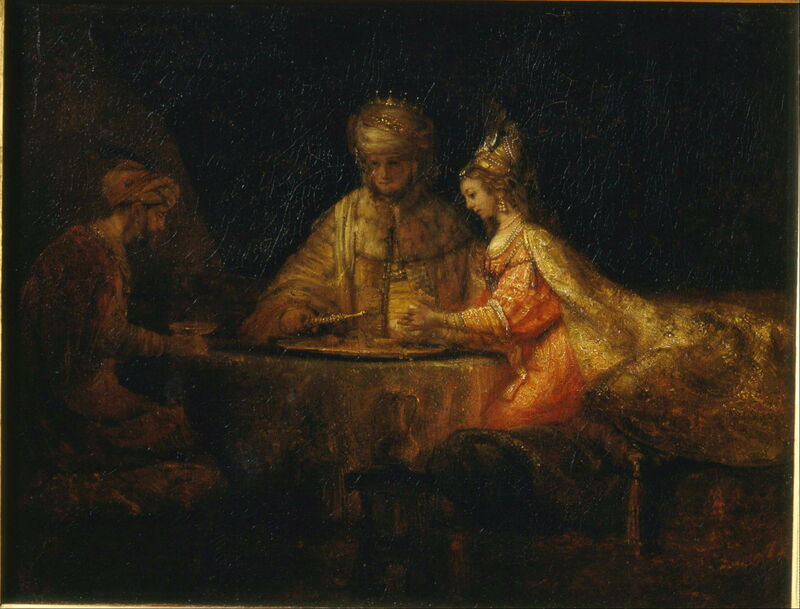 In this painting, Haman is shown in the shadows on the left, with King Ahasuerus in the centre, and Esther – Mordechai’s cousin and Ahasuerus’s wife – radiant in her intervention to save Mordechai’s life. Rembrandt thus used light as a tool to help his narrative. 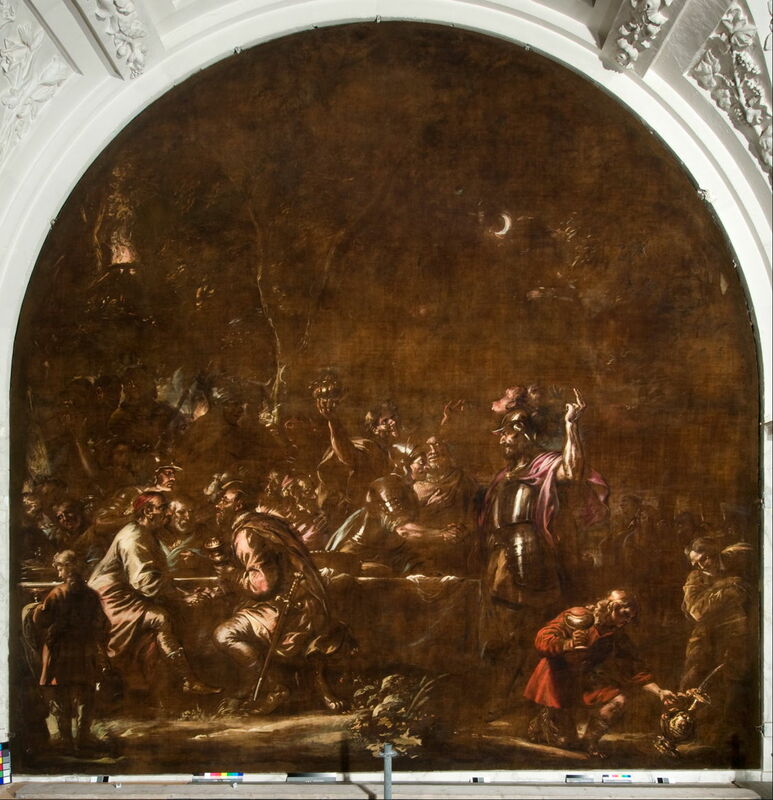 Sadly the painting we see today as Rembrandt’s The Conspiracy of the Batavians under Claudius Civilis (1661-2) is not only much smaller than the original (see below), but its colours are far weaker. A slightly better impression may be gained from the detail shown below, which gives stronger clues as to the blue areas on Civilis’ crown and regal garments. 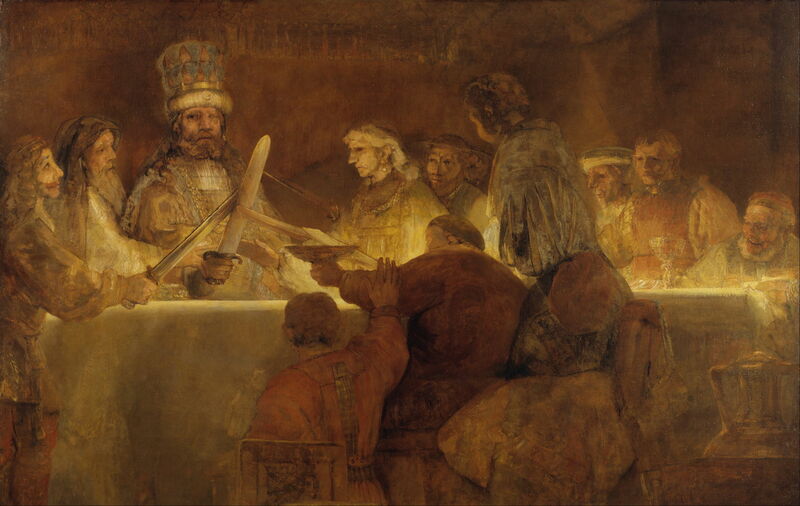 Rembrandt shows us a lofty king of his people, dressed in finery, his lost eye witness to his bravery and experience. His tribal chiefs join their swords and hands with his sword, in an oath to which they will be bound unto death, if necessary. The light, apparently from a source on the table and carefully hidden behind the foreground figures, heightens the moment and its meaning. There was little scope for the use of facial expression here, which has (with a single exception at the far right) to be earnest. But the body language, swords, and light between them make this a moment of true peripeteia, a turning point for the Batavian nation – well, albeit a small tribe, but who would have thought that this great king was leader of just 35,000? Life, even the life of Rembrandt’s paintings, is seldom so simple, though. Rembrandt’s painting was commissioned for what was then the new Amsterdam City Hall, completed in 1655, which is now the Royal Palace. The dozen large spaces intended for paintings were going to be filled by Govert Flinck (1615–1660), who had started but not completed them when he died in 1660. Rembrandt was commissioned to paint his version for the City Hall in 1661, and sketched what he is believed to have completed in the summer of 1662. 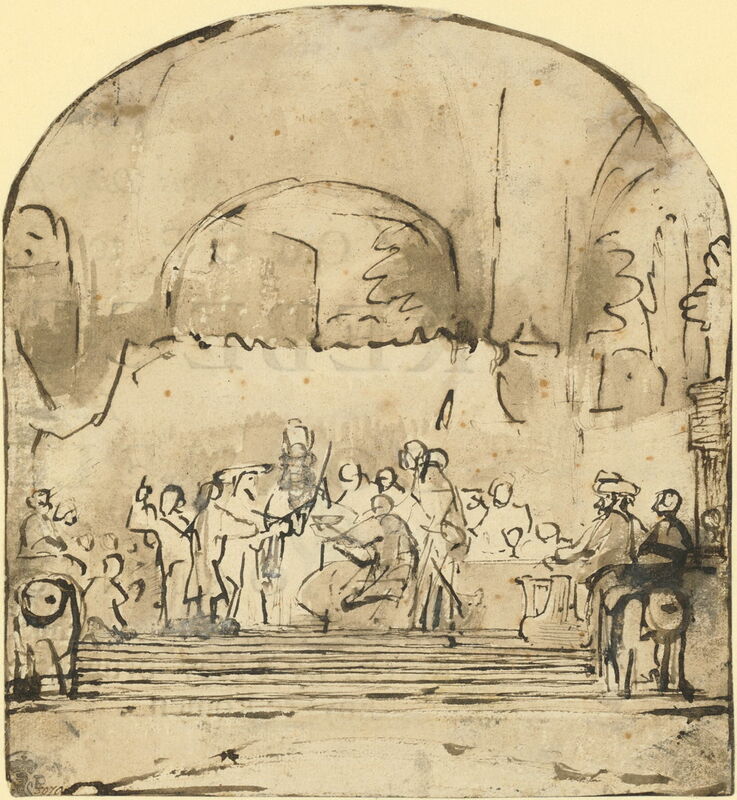 Rembrandt Harmenszoon van Rijn (1606–1669), The Conspiracy of the Batavians under Claudius Civilis (sketch, recto) (c 1659), pen and pencil, brown ink on paper, 19.6 x 18 cm, Staatliche Grafische Sammlung, München, Germany. Wikimedia Commons. The painting which we see today is but a small central rectangle within the original. The whole painting was hung in place for a while, but it appears that it fell into disfavour. It was taken down and returned to Rembrandt. He no longer had sufficient influence to change anyone’s mind in the matter. 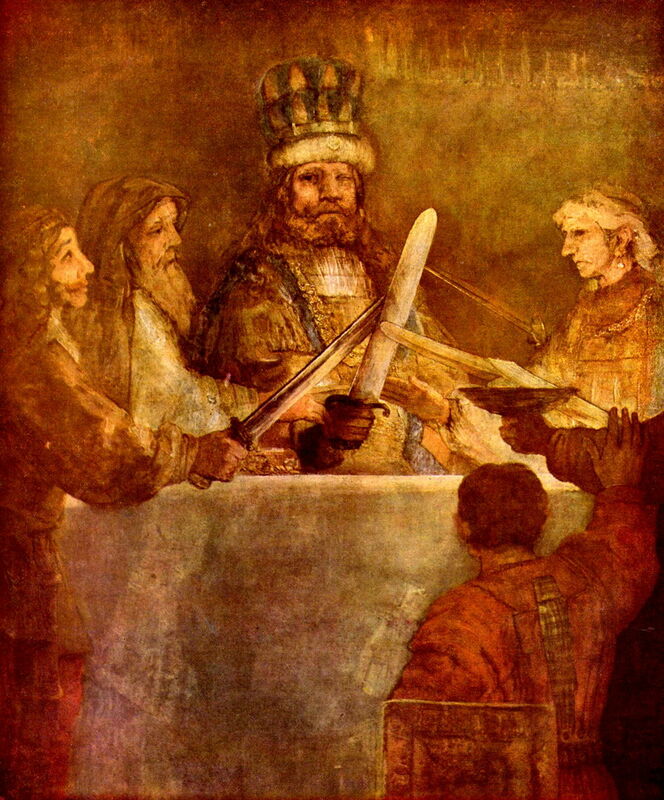 Meanwhile Jürgen Ovens (1623–1678) completed Flinck’s version of The Conspiracy of the Batavians under Claudius Civilis shown below, which was hung instead of Rembrandt’s. Govert Flinck (1615–1660) and Jürgen Ovens (1623–1678), The Conspiracy of the Batavians under Claudius Civilis (c 1659-63), oil over watercolour on canvas, 500 x 500 cm, Royal Palace of Amsterdam, Amsterdam. Wikimedia Commons. Rembrandt was desperately short of money at this time, and was never paid for the original commission. He therefore cut the painting down to a more saleable size, repainted parts of it, and sold it on. A hundred years later, it had made its way to Sweden, and by 1782 had come into the possession of the Royal Swedish Academy of Arts in Stockholm. In 1864 it was transferred to the Nationalmuseum, where you can see it today. The Batavi, or Batavians, became a founding element of the nation which developed in the Netherlands, even though their greatest depiction had been sent away and cut up. As the Dutch East Indies developed and made the Netherlands rich from trade, its capital was named Batavia (now Jakarta). During the French Revolution, the Netherlands itself became the Batavian Republic (1795-1806). But the greatest painting of Civilis and the original Batavian chiefs was already in Sweden. In his later years in particular, Rembrandt’s explorations of light in narrative paintings demonstrated how the artist’s choices can add considerably to the narrative. In Ahasuerus and Haman at the Feast of Esther he used lighting to develop his characters and their roles; in The Conspiracy of the Batavians under Claudius Civilis to transform a renegade tribal chieftain into the founder of a nation. Bikker J et al. (2014) Rembrandt, the Late Works, Yale UP. ISBN 978 1 8570 9557 9. Posted in General, Painting and tagged Batavi, Batavia, narrative, Netherlands, painting, Rembrandt. Bookmark the permalink.